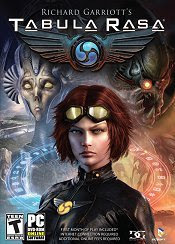 From the ashes of an ancient conflict, a cosmic war threatens all life with death or enslavement. As the alien Bane amass their forces for the final battle, the galaxy’s last free sentient beings are the thin line between life and death, between good and evil. Explore lush forest planets, volcanic moons, and exotic alien civilizations. Face off against powerful alien soldiers, armored mechanoids, and vicious predators! 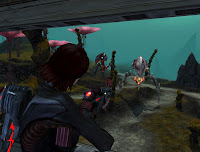 Use a wide range of exotic weapons and unique alien powers to help the Allied Free Sentients (AFS) in their desperate fight against extinction. Tabula Rasa combines a vast, persistent game world and ongoing storyline with fast-paced action, resulting in a striking new approach to the design of multiplayer online games. * Richard Garriott’s Signature Creative Vision: Features a rich storyline with culminating experiences, immersive environments and a persistent plot. * “Logos” Language & Powers: Alien language and powers allow players to harness the very fabric of the cosmos for heals, attacks and more! * Ethical Parables: Players encounter ethical decisions while attempting to complete goals or missions that affect the people and environments around them. * Brings Role-playing to the Battlefield: Fast-paced action involving skill, stealth and strategy combines with character growth and development (RPG) on a massive multiplayer scale (MMO). * Battlefield Control Points: Entrenched positions on a given battlefield can change hands over the course of a battle and affect spawn points and missions of both enemy and friendly characters. * Character Cloning System: Explore different character paths without having to start from scratch. * Deep Exploration: Explore massive planets, each with multiple continents and regions therein. * Squads and Clans: Players will form social bonds by joining or creating non-permanent groups called squads, and persisting groups called clans. * Player-vs-Player: Clans can declare war on each other, enabling voluntary PvP gameplay. * Integrated Voice Chat: Fully integrated in-game communication technology allows players to chat with their team mates using their own voices in real time. No extra software installation required.